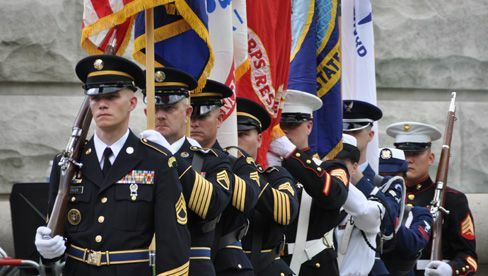 May 30th–American Legion Post #142 and Auxiliary Unit #142 has scheduled a Memorial Day joint-observance. This event will be at the American Legion Hut, 118 South Wood, in Hominy, Oklahoma. Coffee and donuts will be served until 10:30 am. 12:00 noon: Potluck Dinner with Auxiliary. The following speech was released by the American Legion National Organization in observance of Memorial Day. We do this not just because it is right for veterans – but it is what their fallen brothers- and sisters-in-arms would want. During a speech delivered in St. Louis on November 13th, Marine Corps Lieutenant General John F. Kelly recalled the sacrifice made by two Marines in Iraq – Corporal Jonathan Yale and Lance Corporal Jordan Haerter. A couple of years ago, security cameras recorded Corporal Yale and Lance Corporal Haerter on sentry duty outside a barracks housing 50 Marines in Ramadi. A large blue truck loaded with 2,000 pounds of explosives headed in their direction. Nearby Iraqi police did what most normal people facing certain death would do – they fled. Not the two Marines. Knowing that they only had seconds to live, they stood their ground, fired their weapons nonstop at the truck and died in the ensuing blast. According to the security footage – the men did not even step aside but actually leaned into the danger. Their actions saved countless lives. And General Kelly, himself, knows of great sacrifice. Just days before telling about the heroism of his Marines, General Kelly’s own son, Second Lieutenant Robert M. Kelly, was killed in action in Afghanistan. We must honor and remember our fallen – but that alone is not enough. They died not just for their country, but for their comrades serving next to them. The United States would have survived if Corporal Yale and Lance Corporal Haerter fled from their post, but the Marines serving with them would not have. They died protecting those with whom they served. The lives saved are their legacy. U.S. Army Corporal Zachary Nordmeyer also left a legacy. Killed by enemy gunfire in Balad, Iraq, in 2009, Zachary’s family and The American Legion Riders of Speedway, Indiana, Post 500, have raised thousands of dollars in Zachary’s honor for Operation Comfort Warriors. These donations have been used to purchase therapeutic athletic equipment, CDs, electronics and other gifts for wounded warriors recovering in U.S. military hospitals and rehabilitation units around the world. It is nothing short of inspirational that even after heroes like Zachary Nordmeyer have given their lives, they continue to give some more. Shakespeare wrote of the bond between warriors in Henry the Fifth. More than one million American servicemembers have died in wars that our nation has been involved in since the first colonial soldiers took up arms in 1775. Many of them died protecting one another, but they served so that we could keep the things that we love the most – God, country and family. By remaining true to these principles, we honor their sacrifice. Observances like this are happening in communities across America, but there can never be too many of them. Logan had been impressed with how the South had honored the fallen Confederate soldiers for years. In 1868, Logan, the head of the prominent veterans group, the Grand Army of the Republic, issued a proclamation that “Decoration Day,” should be observed nationwide. The date was May 30th – specifically because it was not on the anniversary of a major battle. Still, many communities did not observe “Decoration Day” because of lingering resentments from the Civil War. The alternative name, “Memorial Day,” wasn’t commonly used until after World War II. Federal law recognized the holiday as “Memorial Day” in 1967. As the unofficial beginning of summer, we must never lose focus of what Memorial Day means. It’s not about beaches, picnics or auto races. It is a day to remember. It is a day to remember men like Army Sergeant First Class Lance Vogeler. The 29-year-old from Savannah, Georgia, gave to his country repeatedly until he made the Supreme Sacrifice on October 1, 2010. He was serving his eighth tour in Afghanistan after serving four tours in Iraq. That’s twelve – yes, 12 – tours of duty in both wars in just over nine years since the 9/11 attacks. This husband and father gave to his country until he simply had nothing left to give. We must never forget what these heroes have done and what their loved ones have lost. There are many ways to remember our fallen heroes. The traditional way is with flowers and flags for their graves or with observances such as this. Remembering our fallen once a year is not enough. The widows, widowers, fathers, mothers, brothers, sisters and children remember EVERYDAY. The empty seat at the dinner table, the smaller gathering on Thanksgiving, and the voice of a loved one heard only as a distant memory in one’s mind are constant reminders that they are gone. The American Legion has always shown great pride in our nation’s fallen heroes and unending support for those America sends to continue the fight for freedom in many corners of the world. Whether one fought in World War II, Korea, the jungles of Vietnam, the Middle East or elsewhere, the stories of American heroism and sacrifice continue to resonate. The Preamble to the Constitution of The American Legion calls on us to “preserve the memories and incidents of our associations in the Great Wars…” It is important that all veterans, their families and – in fact, all Americans – pause to reflect on, remember and give thanks to our many heroes. Thank you all for being here. God bless our veterans, our fallen and God Bless America.